This entry was posted in Edmodo, iPads in Mathematics, Mathematics, Technology in Schools, Web 2.0 and tagged collaboration, Edmodo, engagement, enrichment program, extension program, homework, iPad, learning experience, Mathematics, nrich, personalised learning by mgleeson. Bookmark the permalink. I really like how you organized and presented your thoughts in differentiation. Your strategies sound feasible. Not to the extent that you have described, but I have using the general idea of the strategies with Edmodo in my 6 and 7 grade math classes in New York. Here are some of the issues I have come across, and would love your feedback on them. 1. I have about 95 kids in my 3 classes. Even after using the quiz on Edmodo, I feel like I am constantly uploading new material and grading / reviewing the submissions. Even when I am doing this on my own time, I feel like I am always trying to play catchup. Any suggestions on how I can be more “efficient”? 2. Maybe this is a problem with just my kids but motivation also seems to be an issue. I find that most will do just what they need to to get by, but will not push themselves to the next level, until I say that it may count for extra credit. I really want them to “want” to reach the next level of problem solving by applying themselves and think that the platform as described by you would be excellent. How can I do this? 3. And then there is the issue of accessing the material. I use IPad’s in the classroom, and some of the content will not show correctly due to compatibility issues. Any thoughts / suggestions for the above will be greatly appreciated. 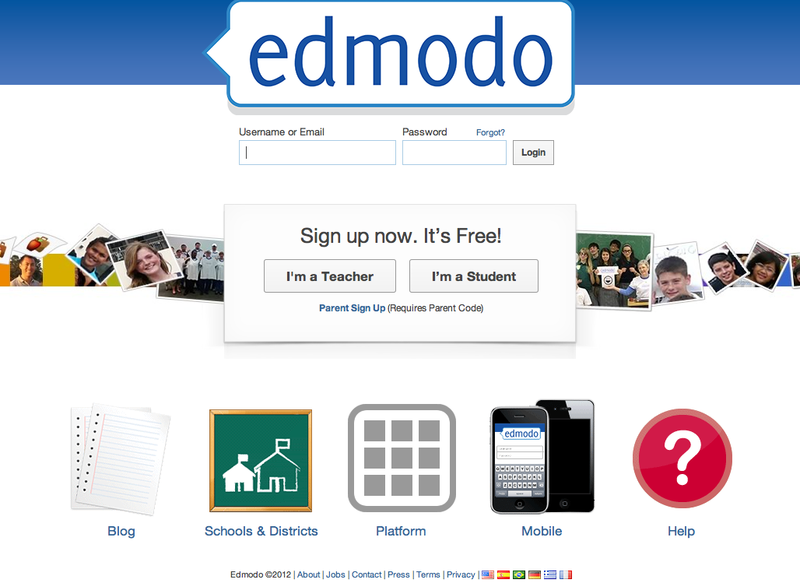 I would love to share and collaborate with you to implement the differentiation programs using Edmodo. Thanks for the comment, Anju. It sounds like you have a real commitment to improving Maths in our Grades. 1. It sounds like a very different situation to mine. You seem to be solely responsible for those 95 students whereas I work with 7 other teachers and collaboratively plan and teach with 200 children. Is there another teacher you can share the load with? Sometimes it comes down to the material itself and how you structure the lesson that impacts on the time it involves. I’m not a big quiz setter. How big are your quizzes? How often do you administer them? As I pointed out in my post, I would be using rich open ended questions that require different approaches and responses to a single task rather than a lot of closed questions with a lot of single answers to correct. I generally assess during my lessons and with the students on Edmodo I can record my comments on the spot as I work with them. This is the general method of how schools are trying to go where I work although there is plenty of struggle in changing over from the question and answer tradition. 2. motivation is always an issue. It is a bigger issue when the work becomes an added on extra rather than a replacement or different set of work. I’m targeting the more able student who are motivated by working on more challenging problems but I don’t know if they want to be doing more work. Differentiation is about different levels of work not differing amounts of work. The extra work ( and this isn’t encouraging 😉 ) should be coming from the teacher initially in planning the differentiated tasks that are geared towards the students working at their level but doing similar amount of work. I intend to use the problems already presented on the nrich website for the content in the enrich/extend class. The work for me is identifying the Maths curriculum content the problem involves so it matches what the other students are doing in the regular groupings. I live by the philosophy of less is more. Students don’t have to do 30 questions to prove they get it. 2-3 independently explained deep explorations of engaging rich problems is enough to convince me they know it. I know that flies in the face of conventional testing. An example of how my philosophy has worked is a year 9 student I tutored for 6 weeks before his end of year exam. He barely scraped in a 50% result before I got to him. I spent 6 weeks narrowing down 3 chapters of his text book ( about 70 pages ) into a half page of 6 key concepts that he could apply to any problem in those chapters. That motivated him to study – 86% final exam. So don’t give them more with extra credit as the incentive – give them reason to succeed. 3. iPad limitations are an issue. We have combination of iPad and laptop access. Do you have computer access? The submitting of work on Edmodo on an iPad is an issue as you can’t add attachment. Web based embedding of online work from other websites does but that may be an issue. I know in my case uploading the ShowMe videos of the problem solving will work because the Showme app uploads straight to their site then the student can just post the link on Edmodo. As a lot of the work I’m planning for is using nrich, which is mostly text/image based, I won’t have a problem with access to material on iPads. If they want to submit documents through attachments to eAssignments they’ll have to use computers though. Not sure if that helps your cause. I’m a tech geek that prefers digital to paper based work so I work better and more conscientiously when I get online submissions. Try to get some of the assessment happening during class. Happy to discuss more with you. Maybe we can connect via Edmodo. It sounds like the students need acceleration, not enrichment to maximize their learning. Why not pre-test the students prior to each unit and flexibly group the students across the teachers. If they have mastered the concept, fractions for example, accelerate by teaching fractions as integers. 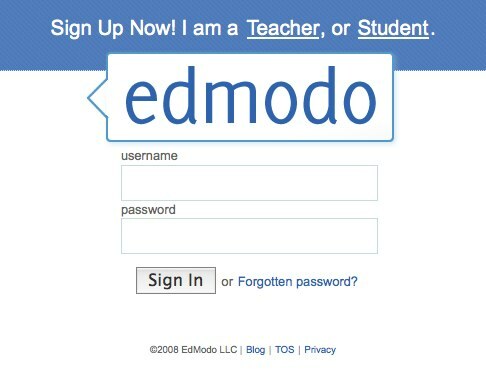 I don’t mean to downplay your interest in using Edmodo. You have already spent a great deal of time thinking about it; however I think ALL students would benefit from pre-testing and given opportunities to accelerate their learning. I tend to agree with your point Mary about all the children needing pretesting before a unit. And we do that at our school so we can address the different levels of understanding. As I said I would like all the children to be accessing Edmodo at their level and I would like to think any child could access higher level thinking tasks if they want to. We’re having a discussion at the moment about how to address the more able students. I’m still getting my head around whether it is enrichment ( work beyond the curriculum) or extension ( the next level within the curriculum.) that these kids need to really challenge them. It may well be after a while we discover only a select few really want or need the enrichment ( which my Edmodo plan may provide) and the rest of the able just need open tasks that give them the chance to extend their knowledge of a particular Maths area. Thanks for the feedback. It’s got me thinking about it more. 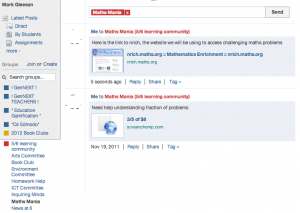 I have a small extension group for maths running in edmodo the extension teacher and I post more challenging problems and videos for them to watch and she sets special assignments. They love it. I find them in it all the time. Posing and solving problems, sharing their learning and being ‘nerdy’ without anyone making fun of them. I also have general groups as well for all subjects. My students love edmodo. I thought you would Henrietta. I’m thinking that may be how it ends up for a while. In my role as Maths Leader in the Senior Grades, Leadership is looking at how I can address the challenge of the more able children not being extended in regular classrooms and working with them as a group has been thought of as an option. Edmodo for me was a way of keeping them on task behind the scenes while still having some input through collaborative feedback. Still thinking. Don’t want them seen as the separate group getting special attention. In the past I have been able to work in the classroom and move them into work beyond what others were doing but it was irregular contact. Trying to develop a consistent program. Thanks for the feedback. Some background on why I’m suggesting acceleration as one approach—our district is struggling with lower than expected growth at one of our grade levels. This cohort has high CogAT scores (http://www.riverpub.com/products/cogAt/details.html). The students are making growth, but they are not growing at the rate one would expect. Our director of assessment is recommending the teachers consider acceleration and descriptive feedback as starting points. These recommendations are based on John Hattie’s work Invisible Learning where he analyzed more than 850 studies on the practices that most influence student achievement. Learning strategies with an effect size of greater than 0.40 are worth implementing. Acceleration has an effect size of 0.88, which is one of five strategies with the most leverage. 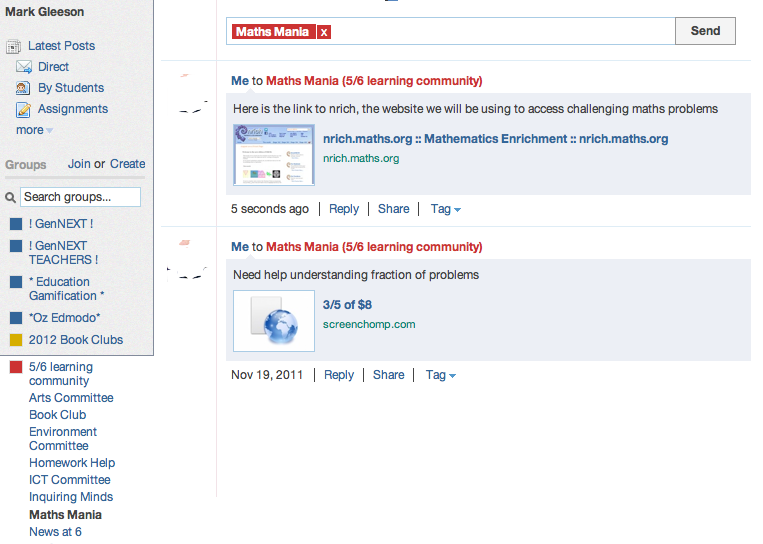 Combining acceleration with your extension/enrichment model with Edmodo would be the best of both worlds. You are probably aware the United States has adopted a K-12 Common Core math curriculum. One shining point is a clear definition of the eight mathematical practices, or characteristics, of mathematically proficient students. Edmodo can certainly enhance those practices. In addition to nrich, are you familiar with Dan Meyer’s blog (http://blog.mrmeyer.com/) and his 101 questions site (http://www.101qs.com/)? There may be some “perplexing” mathematical tasks for your students. Thanks for the follow up, Mary. I’m familiar with Hattie’s work but will look at that in more detail to refresh. Do you have a link to those eight mathematical practices? Being in Australia not aware of US common Core. Appreciate the extra link to Dan Meyer. Will check out for more options. I am curious. 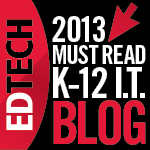 You say you have students submit their work electronically. How exactly do they complete math problems and submit them electronically? Apologies for late reply, Susan. Because we have iPads to use, the children are able to use whiteboard or screen casting apps to record all their work, including voice recording, save it a a video or screenshot in photo library and post it to Edmodo as a file. It works well. Alternatively, many of the tasks are problem solving and their strategies and ideas are just added through Edmodos post/reply system. We aren’t necessarily to equations and calculations all the time. words are sometimes enough. (As you have allured to) Basing your group on NAPLAN testing may be a hit and miss affair. As the statistics that I have noticed are that there is almost 50 / 50 correlation between those that achieve highly in NAPLAN and those that achieve highly in comprehensive assessment. In other words only about half of those that you are selecting are probably capable of extension or enrichment work that will not also leave gaping holes in other parts of their learning. its help full knowledge for students who are facing difficulties in their every day work or assessments.